Welcome to Riga Business School at Riga Technical University! Being at the cross-roads between East and West, Riga has always been a hub of business activity. For more than 27 years Riga Business School (RBS) has provided world class management training to current and future executives. Our strong commitment to high quality, the principles of North American MBA programs and all courses presented in English, makes RBS distinctive. With Latvia being a new member of the European Union, management education is becoming more popular and reaching for new horizons. The RBS MBA programs are there to meet the challenge. With the help of RBS strategic partners, University at Buffalo and University of Ottawa, and integrating the needs of our corporate supporters, the programs are designed to prepare business leaders for the global world of tomorrow - the world, where successful leadership is a combination of knowledge of contemporary business processes and international experience. 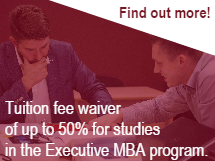 An international faculty and academically strong MBA programs in the dynamic city of Riga bring you an experience that will prepare you for an impressive management career in the future. I look forward to welcoming you to Riga Business School - where business challenges are solved and inspirations originate.